This here is some lovely volunteer lettuce. I think volunteer lettuce is the prettiest don't you? It's pretty dang easy to get volunteer lettuce and eat some of your own homegrown salads before anyone else. All you gotta do is let at least one variety go to seed. You can even still harvest some of the leaves, probably as much as you would get if you chopped off the whole head. Once the little fluffy dandy-lion like seeds have formed, you just either let them go on their own in the wind wherever they may land (your lawn or cracks in the patio) or you can pluck them out yourself, and scatter them in the fall where you'd like them to grow in the spring. A true lazy gardeners delight! What have you been able to get to "volunteer"? 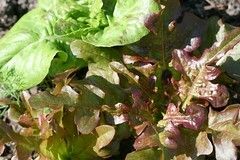 *pictured is Red Oakleaf and perhaps a variety of butter lettuce from a variety pack I planted last year. Anyone out there having a bit of trouble getting your little ones to emerge from their dark little cocoons? well, I thought I'd share a few tips and secrets I've picked up over the years. 1. Get a heat mat. You may think you don't need one, or they're too expensive, but let me tell you what a revelation it was when I finally got one last year. My seedlings used to take FOREVER to come up, and sometimes not at all. My germ rate was way too low. I thought it was just the seeds - but no, it was that they were too cold (and also packed in too tight, but we'll get to that in a minute.) 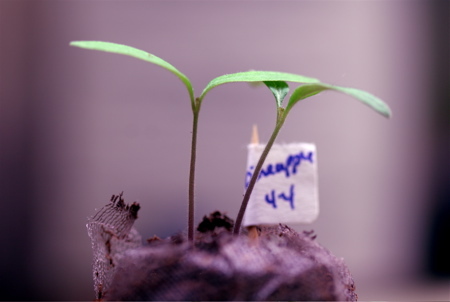 Once you get a heat mat, your seedlings will be leaping up overnight. Yes, they actually will. If I don't check mine in the morning, sometimes they are already up about an inch by the time I get home from work. 2. Don't pack 'em in. When I first started trying to grow tomatoes from seed, I got my little peat pots and I looked at the directions on the pack. Ok peat pot expanded, seed 1/4 inch in, cover up and squish that peat down nice and cozy. Bzzzt! Nope. Seeds need not only moisture, but air to come to life. If you pack them in there, they won't be able to breathe. Now, I put the seeds in and barely push the peat over the top. Works like a dream. 3. Put 'em in the dark. Seeds need dark to germinate for some reason. I know it doesn't make much sense, I mean in the "wild" the seeds would just fall on the ground and have to sprout in broad daylight right? I dunno. Just cover them up with something opaque like a box top or some newspapers though, ok? 4. Plant at least 2 seeds per pot. I know, I know you don't want to waste seeds. Well, I didn't either, so instead I wasted time. Precious, precious time. Time those seedlings could have spent getting big and strong and ready for the "real" world. Just this year I decided to plant at least 2 seeds in every pot, and I can tell you every peat pot I planted has a seedling growing in it. Now my problem is I have too many, but that's a different kind of problem. The problem of insanity - but that can be solved with medication. Your weak little undergrown seedlings cannot. 5. Don't keep 'em too wet. Once your seeds sprout, you do need to remove them from their dark moist cave and bring them into the light. Be sure to check them daily - or twice a day is best. You'd be surprised how fast they can shoot up -I always am. If you've tried all the above and been a very good little girl (or boy) and your seeds still don't sprout, I have one secret that I use. I call it "fluffing". You just take your fingernail (or similar small pointy object) and gently kinda dig into the top of the pot sort of fluffing up and pushing the peat aside until you uncover the seed or seeds. Then, you very softly cover them up again, and don't add any water for a day. You can also make sure when you do this that the seed wasn't planted to deeply. They don't like that either. Too shallow is actually better than too deep. Well, that's all I got for right now. I hope some of these help. Lemme know 'eh? I know it's too late for most of you. 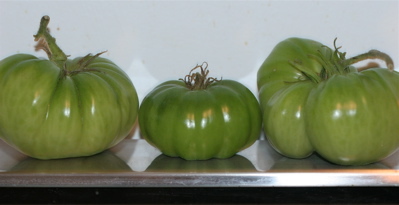 including me, but I thought I'd post a picture of good indoor ripening tomatoes anyway - since Nick asked a while back. All three of these are good candidates and should ripen just fine on their own indoors. Perhaps I'll leave them sitting on the stove and give you an update photo later. When you pick a green tomato for indoor ripening, remember they should have a slight bit of give, and have a nice shiny appearance. If they are dull and fuzzy, they may change color, but they won't be any good at all for eating, which I assume is what you are bringing them in for. Also, if they feel at all like a tennis ball they are probably also too young to bring in and may be really mealy and dry as they have not soaked up enough water yet. If you are desperate though, say the eve of a hard frost, go ahead and bring them in. The worst they could do is rot on your counter and make a mess. You may however get lucky and still be eating tomatoes from your garden long after your neighbors. The longest I stretched it out one year was past New Year's, but that's another story. Yes, Fall is here, and that means that most of your garden has either slowed down or stopped all together. There are some things you can do though to prolong at least your tomato crop. The picture above is a good example of one. 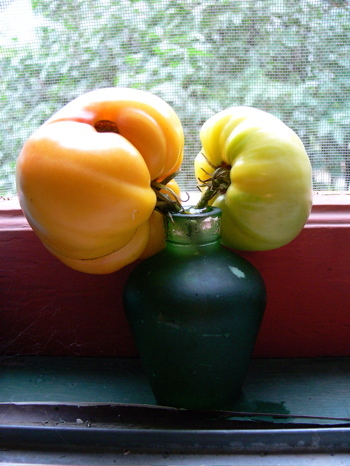 Just clip your green tomatoes off with a stem long enough to stick in a jar or vase of water. This will keep really green tomatoes hydrated so they stay juicy as they ripen instead of getting dry and mealy. Tomatoes that are just about to ripen can be snatched from the jaws of hungry vermin by simply bringing them inside and setting them out on the counter. I like to put them on a paper towel as the bottom will sometimes rot when in contact with the non-porous countertop. They should ripen before they dry out and thus retain their full juiciness. You may lose some to the indoor nasties (fruit flies) but most will make it as long as they don't have cracks or holes already. You may put your youngins into a paper bag, some claim this speeds up the ripening process as they can share their little ripening gasses. I on the other hand am crossing my fingers that mine ripen very slowly, as we are already swimming in tomatoes - never thought that was possible. The last option, I would actually like to dispell - if any of you have had luck with this though, please let me know. That option is pulling up the vine with remaining green tomatoes intact and hanging it upside down in the basement. I tried this last year with several of my vines, and even some of my potted ones, and all they did was shrivel up and rot - every last one of them. They didn't even ripen one little speck. I would have been much better off with one of the other methods. Anyone else have any other tricks? I'm all eyes. And please, don't be afraid of the new comment procedure, it won't bite - at least not as hard as the comment spam did.